How should you divide a preschool classroom? 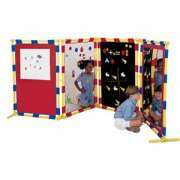 Preschool room dividers make it easy to split up a classroom. Room partitions help young students find the activity center they are looking for and focus on the task at hand. At Hertz Furniture, we have a wide selection of wall partitions that are designed specifically for a preschool or daycare. With great room dividers, partitions and activity panels to choose from, you can find many options that will suit your space perfectly. Many of our models even come with a complimentary extended warranty. 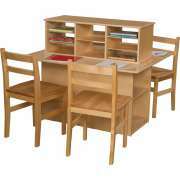 In a preschool classroom, every piece of furniture has the potential to serve an educational purpose. Great partitions don&apos;t just divide up a space, they also add fun and color. 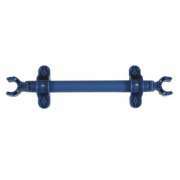 They can also serve as a hands-on learning tool. Our play panels come from top manufacturers who specialize in safe and educational early-childhood furniture. How should I arrange the learning centers in my preschool classroom? Many early-childhood, daycare and preschool settings organize a room according to learning centers. This arrangement helps little ones find the activities that appeal to them and enables them to choose where they would like to go. Preschool partitions provide a great way to separate activity centers so young students can focus on the materials they have chosen to work with. Tired of children getting woken up prematurely during nap time? Does noise and light from the hallway interfere with quiet rest time? 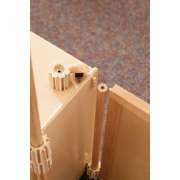 Preschool room dividers minimize interference from outside sources. 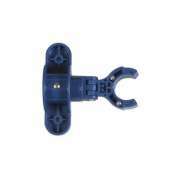 They can be used to separate napping children from potential disruptions in the classroom or hallway. They create a private space so little ones can relax and feel comfortable as they drift off to sleep. 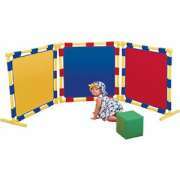 Children&apos;s factory play panels come in a few styles which are appropriate for various settings. Their height is ideal for separating different areas of the room or blocking off extra furniture that you don&apos;t want children to be playing with. 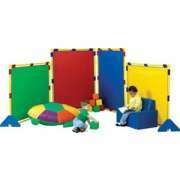 Children&apos;s factory room dividers come in fun and engaging surface materials. 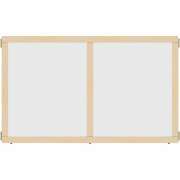 There are magnetic dry erase, flannel, transparent and mirror panels. When you furnish your classroom with dividers in a number of different materials, you encourage students to explore the textures and properties of various mediums. How can I divide an early childhood classroom in a colorful way? Room dividers can also be used to bring some extra color into your space. If you just want something that will separate areas of the room, but not necessarily provide activities, rainbow portable partitions are a good option. They can be arranged either vertically or horizontally. 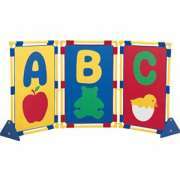 For an extra piece of engaging educational decor, try illustrated alphabet dividers. With such an appealing design, they will look more like room decorations than dividers. Preschool partitions can facilitate creativity and imaginative play. Dramatic play panels enable young learners to make up their own games or put on a puppet show. These activities encourage the development of important skills including appropriate social interaction, turn taking and cooperative play. While your little ones aren&apos;t quite ready to use social media or worry about Common Core State Standards, the life skills that they learn in preschool will stay with them throughout their educational careers and beyond. These skills will ultimately have a great impact on their academic, social and personal success far into the future. 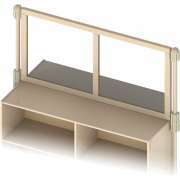 What kinds of natural room dividers do you have? 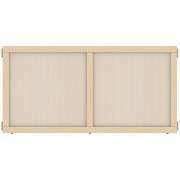 Wood Designs room dividers offer a safe, natural solution to all of your space-separating needs. 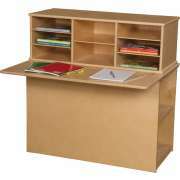 Their natural wood frames are constructed with fully-rounded corners and edges and a Tuff-Gloss finish for a secure and healthy learning environment. Their kid-friendly features include engaging surface materials including acrylic, pegboard, flannel and markerboard. Each of these options encourages students to examine materials and engage in educational fun. What is the best way to divide up a preschool classroom? The ideal way to divide a room really depends on the ages of the children you are taking care of. 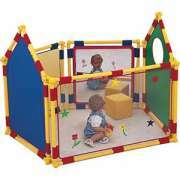 Caregivers who are supervising toddlers or babies might want to consider a bright baby corral. 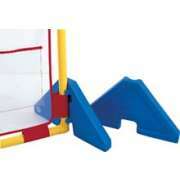 The secure soft walls of these playpens keep little ones safely enclosed in a fun colorful space. They provide plenty of room for toddlers to explore, move around and have tons of fun. Preschool room dividers do way more than just separate a room. 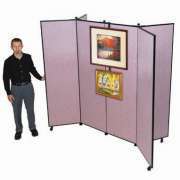 You need portable partitions that are flexible, functional and attractive. At Hertz Furniture, we offer the best room partitions for any early-childhood setting so you can find a budget-friendly solution for your preschool or daycare. The Hertz Design Center is here to help you determine the ideal selection and configuration of wall partitions so you can divide up your learning space in the best way possible.